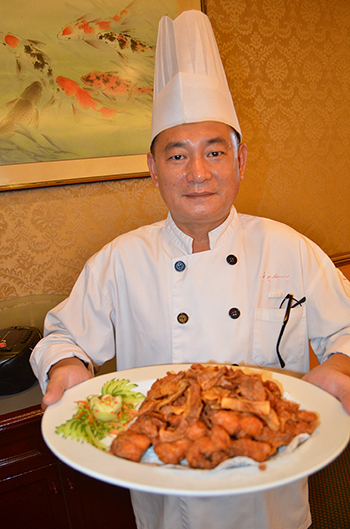 The Hop Sing Chinese Restaurant at Ponderosa Golf & Country Club (Ponderosa) is offering new menu items with the introduction of its new Head Chef, Lean Poh Leong. This year, Hop Sing Restaurant will be doing away with Shark’s Fin for its two Chinese New Year Set Menus. The menu valued at RM998++ will feature Braised Superior Dried Scallops & Crab Meat Soup to replace previous year’s Braised Shark’s Fin Soup with Crabmeat, while the menu at RM1388++ will offer Braised Superior Crabmeat, Scallop and Snow Fungus Soup. The Fortune Set Menu at RM998+ serving 8 – 10 persons include Salmon Yee Sang, Braised Superior Dried Scallops & Crabmeat Soup, Roasted Crispy Chicken, Steamed Grouper Hong Kong-style, Braised Broccoli with Dried Oysters, Seafood Balls & Vegetables, Deep-fried Prawns in Soya Sauce, to finish off with Chef Leong’s special XO Sauce Fried Rice and Chilled Sea Coconut & Longan for dessert. The Prosperity Set Menu at RM1388++ per table serves Pacific Clam Yee Sang, Braised Superior Crabmeat, Scallop & Snow Fungus Soup, Steamed Fresh Grouper in Chef’s Special Sauce, Braised Broccoli with Black Mushrooms & Abalone, Yuan Yang Chicken, Pan-fried Prawns with Chicken Floss & Mayonnaise, Special Steamed Rice in Lotus Leaf and for dessert, White Fungus with Glutinous Rice Balls. Previous articleAre You Interested in Buying a Property This Year? School’s Out and Fun’s in With Upin and Ipin!